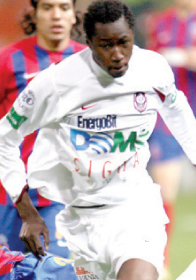 Definitely the most wanted player from Liga I, the Ivorian forward, who just missed out on the trip to South Africa, returned to Cluj determined to part ways with CFR. His statements are the opposite of what has been served to the media a week ago by club president Iuliu Muresan, who said that Traore won’t leave Cluj, in spite of the incredible competition for a place in the first eleven, following to the arrival of Sasha Bjelanovic, and the public interest from several clubs, including Arsenal, Napoli, Hamburg, Udinese, Gatalasaray or Rennes. “I don’t want to stay for another year, even if I’ll get the chance to play Champions League football, I want to leave, I’m not going to spend all my life here”, said the 19 years old, who scored just six goals last season and had a rather mediocre campaign. His price tag is around 4 million Euros, a sum CFR was hoping to double in autumn, when the champions will be playing in the champions’ competition. 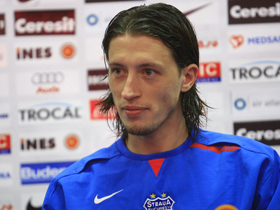 This is not a joke: Materazzi to FC Brasov! FC Brasov parted ways with 17 (seventeen) players this summer, 5 regular starters went to Rapid, 1 to Steaua, 1 to Dinamo, 1 to CFR, 1 retired, all the good guys that missed out on Europa League in the past to seasons are gone. The team can count now on two defenders, one midfielder and two strikers who have at least some experience in Liga I, and I consider this team the first relegation candidate for next season. Which, by the way, starts in less than a month. So this should better be a nice practical joke, staged by FC Brasov’s official website and the top newspapers in the country! Steaua’s anchorman Ovidiu Petre left Romania today, after agreeing a move to Al Nasr, where he’ll team up with another national team player, Razvan Cocis. Both were demanded by Walter Zenga, who said in a recent interview that he would definitely enjoy coaching Romania in the future. So, when Petre speaks about an offer he couldn’t have refused, should we think at least for just a couple of seconds that he makes this move thinking about the future, not the money? I’m not that bad for a PR job, right? And I’m also cheap, Ovidiu! On the black list and looking at least for a good destination to spend a year on loan are Rade Veljovic, Ousmane Viera, Vitinha, Dario Flores and Diego Ruiz, all good players by Liga I standards, with centre back Viera showing also some potential to develop in the near future. CFR Cluj gets Bjelanovic, the under one million euros baby! It’s official, Vicenza’s centre-forward will play Champions League football and earn a decent salary: 350.000 Euros per season. Demanded and convinced by Mandorlini, “Grande Sasa” agreed to a two years long contract, with the option to extend the deal for one more year and forced CFR to pay an important fee for a 31 years old: 950.000 Euros. Which means that CFR wants results in the near future, but also that one of the following guys – Yssouf Kone, Lacina Traore, Cristian Bud – has already packed his bags. My bet is on Kone, who played way below his ability in the previous season, has a similar wage with Bjelanovic – huge, by Romanian standards! – and entered the last year of his contract, lacking any interest from other clubs. So, if Kone gives up the remaining salary, he’ll probably be allowed to move on a free transfer, which won’t happen with Traore (too expensive for what he can offer right now) or Bud (wanted by FC Bruges, but not desperately enough to meet a 2 million Euros asking price! ).